When dark, sinister clouds loom, Victoria and Joe find themselves facing life-changing decisions. Happily, silver linings also abound in this, the fifth Old Fools chronicle. A fresh new face joins the cast of familiar characters but the return of a bad penny may be more than some can handle. What does the future hold for the Spanish village of El Hoyo and the two old fools? Includes recipes and link to FREE Photo Book. 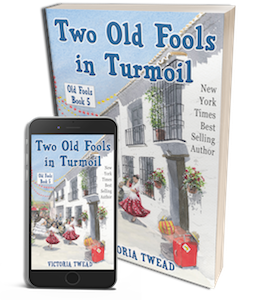 Victoria Twead is the New York Times bestselling author of Chickens, Mules and Two Old Fools and the subsequent books in the Old Fools series. After living in a remote mountain village in Spain for eleven years, and owning probably the most dangerous cockerel in Europe, Victoria and Joe retired to Australia where another joyous life-chapter has begun.